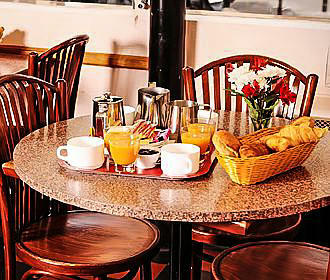 The Hotel Marignan is a 1 star hotel located in the 5th Arrondissement of Paris within the Latin quarter providing rooms for individuals up to five people, with breakfast included in the price, free WiFi, free use of washing machine and dryer and a kitchen. This is a family run hotel that has been in the same family since 1955 and although only a 1 star hotel in Paris, the Hotel Marignan has a warm and friendly atmosphere, which is family friendly with different types of rooms to suite all budgets. The Hotel Marignan has seen many distinguished guests over the years from writers and poets through to artists and philosophers and there is a library with guide books and novels available for guests to enjoy. With multilingual staff at your service, the cost of the room also includes a free continental style breakfast from local suppliers with fruit juice, bread, croissants and jams, etc, yet during your stay you can also access the equipped kitchen, so that you can prep your own snacks and meals, which is ideal for those on a budget. Free WiFi is available, plus there is also an internet enabled computer for the use of guests, and a very unusual feature is the fact that you can also use a washing machine and dryer completely free of charge as well. Having been recently renovated to offer bright and airy rooms with WiFi internet access available in your room, there are a variety of different hotel rooms available depending upon the number of people and budget, ranging from a single room through to a family room suitable for five people, with a basic and easy to figure out pricing structure for low, mid and high season rates. With a single or double room you can opt for a shared toilet and shower in the hall, a private toilet and shared shower or a hotel room with your own private toilet and shower. 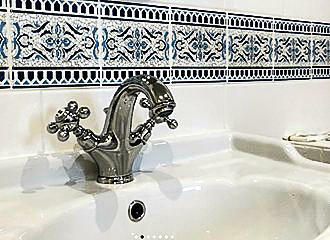 When it comes to a triple or quad room, the options are a private toilet and shared shower, or a private toilet and shower, however, if you are looking at booking a quad room or quint room, as it is referred to by the Hotel Marignan, then you also have the option of a private toilet, shower and bathtub. 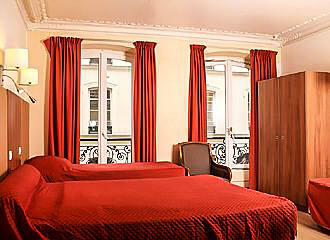 Located within the Latin Quarter of Paris in the 5th Arrondissement, the 1 star Hotel Marignan is close to many popular tourist attractions along with many colleges and universities such as the Sorbonne. You will find that the nearest Metro stations are the Maubert - Mutualite stop serving Line 10, which is approximately a 2 minute walk, or the Cluny - La Sorbonne stop in the opposite direction on the same line, but the Saint-Michel stop serving Line 4, is approximately 5 minutes walk away. However, the Bus lines 21, 27, 38 and 63 will also get you close by, plus the RER train station called Saint-Michel - Notre Dame serving RER Line B and RER Line C is only approximately 5 minutes walk away as well. Yet rather than using public transport when you are flying back home, the Hotel Marignan can also organise a taxi to take you to either the Orly Airport or the Charles de Gaulle Airport for a preferential rate and a fixed price. But if you are travelling into Paris via your own vehicle, then there are also two public car parks located close by, which are open 24/7.